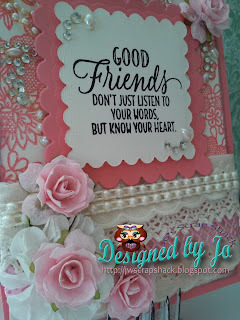 ~Jo's Scrap Shack~: Doilies and/or Lace, challenge #55 with Dies R Us! 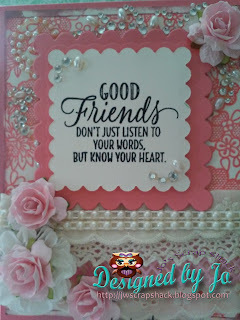 Doilies and/or Lace, challenge #55 with Dies R Us! 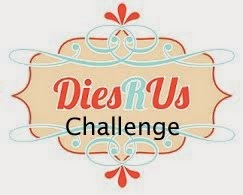 Welcome to a new challenge at Dies R US and I sure hope that your day is going well. So excited for our mid month challenge because today's challenge is all about everything that I love, doilies and lace!!! The challenge is to use either doilies and lace or one or the other! So boy did I go all out using some beautiful lace that I have been hoarding! Here is my project for today's challenge. My card is a standard A2 size and I used cardstock from Stampin' Up, Very Vanilla and Flirty flamingo. I wanted to stick with two colors and I thought these two colors complimented each other well. 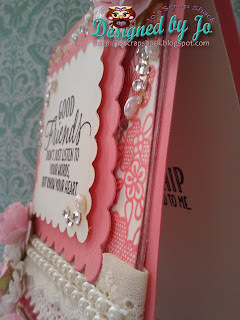 I started off creating my main card front layer by stamping my "all about lace" background stamp by Stampin' Up, in flirty flamingo ink onto very vanilla cardstock. I figured that would be a great way to add a nice pattern and of course it's lace! From there I just started to build! 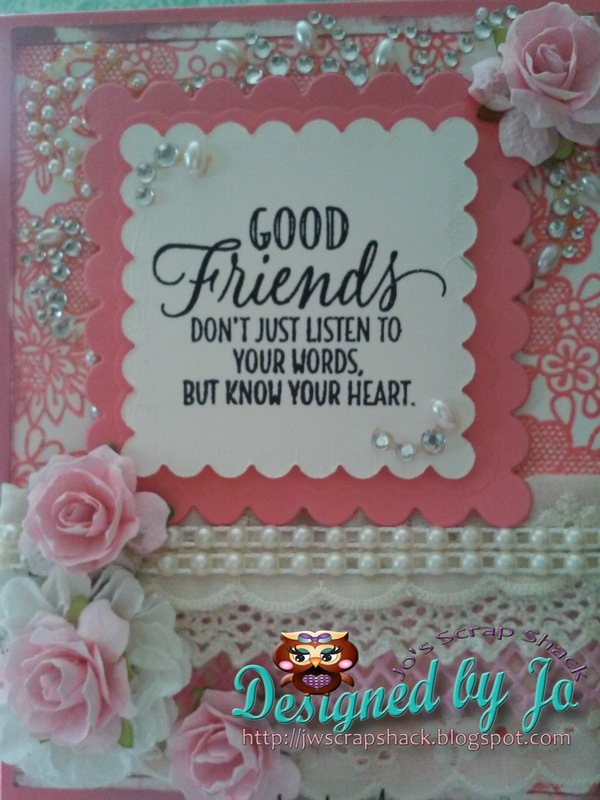 The sentiment that I used is from My Creative Time and the scallop squares framing the sentiment were cut out from my Megan Elizabeth pink dies. I used the "Spellbinder's nestabilities classic rectangles" to cut out my layers. On the outer layer, I inked around the edges using some tattered rose distress ink. I used two different laces for this card. The large floral-scallop edge lace was used twice for two separate rows, one on the top and one on the very bottom. In-between these two rows of lace, I added in a second cream colored lace to overlap the first row of lace and under that, I used a faux looking lace in pink, which is actually a border from the "Spellbinder's borderabilities Deckle S4", to overlap the cream lace. It looks like 4 rows of lace and I just love how it looks!! I then added two rows of cream colored pearl strands to the top of the lace rows to give it some texture and make it look more feminine. To finish off my card, I added some gorgeous tea roses. These were made using the" My Favorite Things Mini Hybrid Heirloom Rose Die-namics" and then I used the "Cheery-Lynn Designs Tea Rose Small" for the leaves. I also added in one large flower that I already had cut out in tissue paper from a previous project and used it to go behind one of the roses. Then last but not least, I added some real pretty rhinestone and pearl bling from Prima. 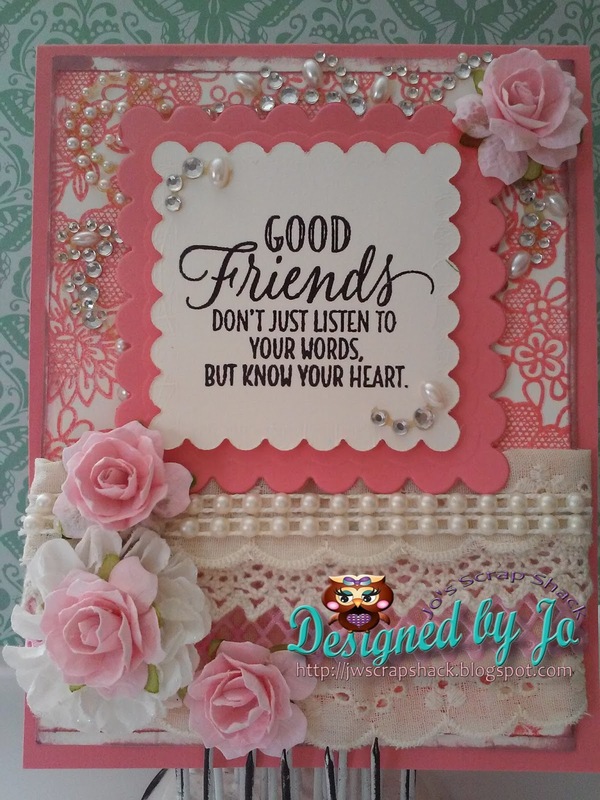 I truly LOVE how this card turned out and it is going to be sent to a very special friend. Some of the dies that I used for my project can be found in the Dies R Us Store HERE. Here are a couple more photos of the finished project. Jo, you have outdone yourself. This is gorgeous!!! I love the colors. Your stamped background is perfection. Your laces are just beautiful. Lovely layers, gorgeous flowers. Just beautiful! Beautiful cards. Love the dies you used. Fabulous sentiment to showcase. Love how you framed it and used just the right amount of bling. Beautiful flower arrangement. Wow, this is so beautiful and elegant Jo! I love the colors and the pretty papers you used! 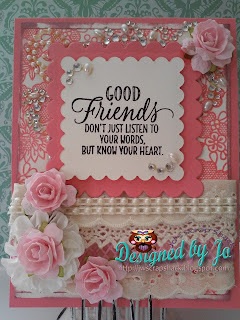 The layering looks fabulous and the sentiment is perfect and so true!! The pearls, flowers and flourishes look spectacular! LOVE this! Wow is right! This is just stunning. Love all the layers and gorgeous flowers! 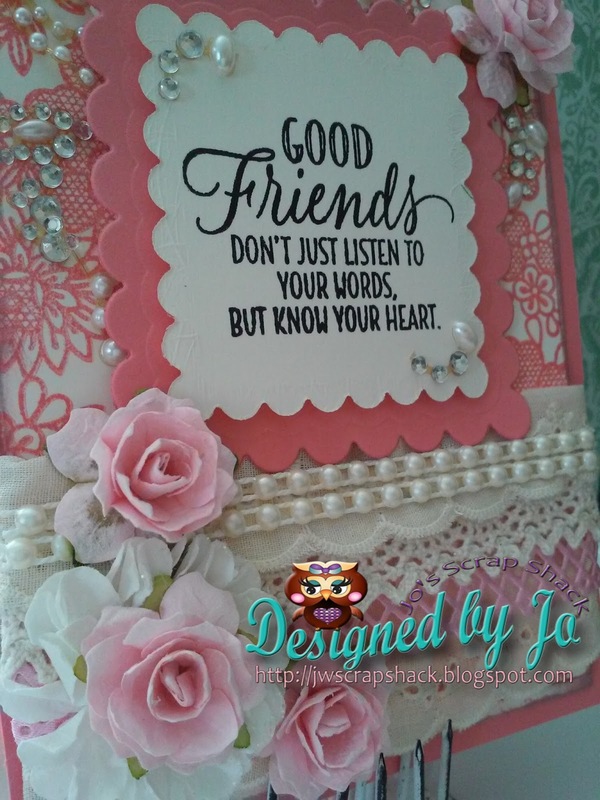 What a wonderful saying and you showcased it so beautifully, great colors and embellishing, what a treat this will be for the recipient! I don't know how I missed this post...I absolutely love the beautiful sentiment! I love the pretty flowers and bling. I really love the beautiful background! This is such a great layout. I love all of the bling on this! So fabulous. Beautiful card!! LOVE all the details!! Stunningly beautiful, feminine card--I'm in awe!